A massive shock wave rolls across the surface, igniting sheep and pigs like a match to paper. You feel as though you've been turned inside out and upside down. You glance at your Air Force-supplied fatigues, and you see your bones through the shirt sleeves, as clear as any X-ray. Then, having expanded as far as it could, the shock wave recoils as fast as it expanded. This is the implosion and it grabbed Jim Skaja by the neck and hurled him from the foxhole whose slight security saved his life. And in saving his life that foxhole allowed him to explain what it's like to endure a nuclear blast, which he did on Thursday in a conference room at the Heritage Ridge Retirement Community on Fort Crook Road where he has lived since 2011. The Air Force was not messing around on April 22, 1952, when it dropped a 31-kiloton nuclear bomb at the Nevada Test Site in Nye County, Nevada. Neither of the two atomic bombs dropped on Japan seven years earlier exceeded 22 kilotons. I thought Iíd been to hell, Skaja said. I don't know why I'm still here. The bomb was the third in a series of eight to be detonated at the site between April 1 and June 5 of 1952 and was the first to be broadcast live on television, although the presence of foxholed soldiers at Ground Zero was unknown to those viewers, even if the presence of sheep and pigs tied to ground might have been. The role played in those early nuclear tests by Chief Master Sgt. James M. Skaja, as he would eventually be known upon his retirement at Offutt Air Force Base in 1975, is acknowledged by his induction into the National Association of Atomic Veterans, a tax-exempt charitable organization that advocates for military veterans of atomic research. It is the only evidence that Skaja, along with other veterans, was at Ground Zero that day. The presence of military personnel was designed to gauge the effect of a nuclear blast on the psychological and physical condition of human beings, Skaja said. It was top secret stuff, he said, and participants were warned they could not talk about it for 45 years. It was an involvement that might be described as a highlight of Skajais 30-year military career that saw him serve in World War II, Korea and Vietnam. During those years he served first with the Navy, then with the Army and finally with the Air Force, where he spent 24 years 15 of those with Offuttis Strategic Air Command. In Korea, Skaja solved a reliability problem with the Quad 50 anti-vehicle machine gun whose hydraulic fluid froze during that wars famously cold weather and caused the gun to seize. He used sewing machine oil instead, and it worked. He lost an eye and most of his teeth in Vietnam, and baked through a nuclear blast in Nevada. Sprightly still and articulate as he approaches his 90th birthday on (of course) the Fourth of July, Skaja still serves. ?He drives to Lincoln and Omaha as an adviser to the U.S. Department of Veterans Affairs hospitals, and not long ago retired from 15 years with Bellevueís Hillcrest Health and Rehabilitation where he worked with the elderly. Recently, he said, he received a call from Nebraska Gov. Pete Ricketts thanking him for his service in those Nevada nuclear tests and informing him that henceforth July 16 would be known as Atomic Veterans Day in Nebraska. Skaja said he is one of five Atomic Veterans in the state. Skaja was 17 when he enlisted in the Navy in 1944. He served in the Battle of Okinawa and in the Philippines Campaign after attending gunnery school in Seattle. 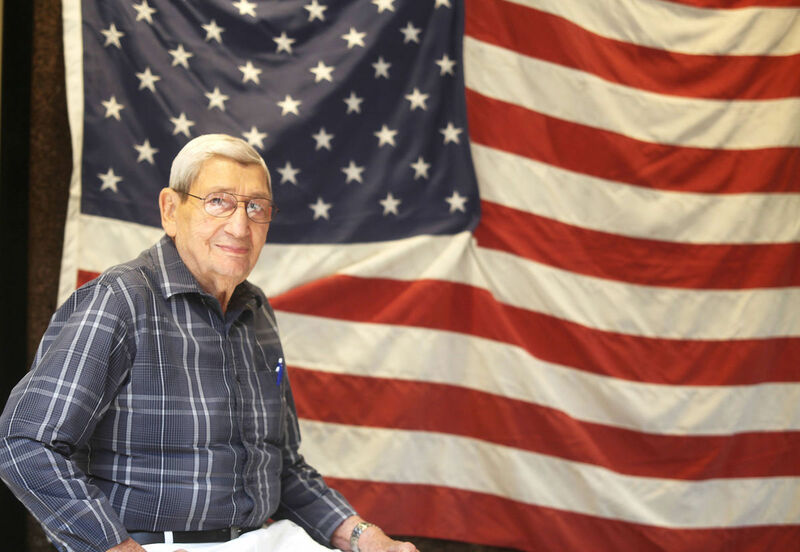 He left the military after demobilization but found employment scarce in his native Bigfork, Minn., and signed up with the Army just in time to be assigned to Korea, after which he joined the Air Force and was deployed twice to Vietnam. It has been a colorful life that included private-sector work in Saudi Arabia where for two years he worked as an instructor for the F-5 aircraft, and later as a test manager for nuclear systems. Three brain tumors one in 1986 and two in 2002 which Skaja attributes to those long-ago nuclear blasts, have not slowed him, though he said he fears another from which, at the age of 90, he might not recover. I've got too much work to do yet,î he said. ìLife is like riding a bicycle. If you slow down you might fall off.